Among what seems to be an ever increasing number of street artists, the one operating under the acronym AFK really stands out. Based in Bergen, Norway, his works are receiving growing attention. In a short time, his artistic creativity, technical ability and impressive production of new pieces has established AFK a tier above most of his fellow street artists. At first glance, AFK might comes across as “another Banksy rip off”, but AFK possesses a distinct style that makes him easy to recognize. He seems to prefer to work within the greyscale, although he adds a little color in a pop-art fashion to highlight elements in his pieces, usually by a subtle use of what has become his signature colors; pink and purple. Other favorite elements in addition to children and animals, seem to be the use of world maps and striped legs. With an impressive production of well placed unsanctioned pieces combined with large murals, his reputation is growing also outside Bergen. Today the signature, AFK, can be seen on walls in Spain, Italy, UK, and France to mention just a few countries. Street art is international and AFK certainly speaks the language. He first appeared for the public in the fall of 2013, when exquisite stencil pieces combining the sweet and innocent with sobering messages started popping up around Bergen. Children and animals often occur in these pieces, but there is always a twist, always a thought provoking idea attached. “Rain” is perhaps the most significant piece from the early period. This visually stunning composition depicts a girl and a Panda bear with their backs facing each other while staring into their phones. Although the girl has a huge umbrella, she does not share it with the panda. This early piece lures you in with it’s beauty, but if you look at it for just a few seconds, you will sense intense sadness. Why? Perhaps because they are staring into their phones and possibly messaging each other instead of talking. Or perhaps because the umbrella is painted as the world and the girl chooses to not share it with the panda. It’s not clear what it symbolizes. Lack of communication, racism, environmental concerns? Whatever it is, it’s very typical of AFK and sets a benchmark for later works. AFK comes across as very conscious and bold when it comes to placement of his pieces. This has resulted in some of the best placed pieces in town. In 2014 he somehow managed to put “Stolen Child” on a wall under a rotating camera at the city tram stop at Danmarks plass, while “Ice Diamond” was perfectly placed on the top of Mount Ulriken the following spring. By the end of 2015, AFK is considered elite internally in the Bergen Street Art Scene, and even getting outside recognition by the establishment when winning the Bergen City Council´s street art and graffiti award. However, in 2016, his talent and boldness would make him a household name in Bergen. In February “Awakening” suddenly appeared over night under a well known bridge in the city center. The approximately 10 meter long painting was a realistic image of a huge, sleeping, naked baby. It immediately became a local news headline. Not only was this artwork impressive in its own right, clearly painted by an accomplished painter, but what made this piece brilliant according to many, is the artist’s clever integration of the arches beneath the bridge in the composition. By dividing the image into three, one image in each arc, the baby appears to be sleeping behind the arches, inside the wall. The effect is quite stunning and anyone passing by can not help but notice the sleeping beauty. As always with AFK though, there is more than just superficial visual appeal. The baby has a third eye on his forehead, a familiar symbol in art. One interpretation might be that the physical eyes perceive the physical world, the third eye sees the true world. A few months later, the same piece got even more attention. This time the artist himself was not involved, but rather a contractor removing illegal graffiti for the Road Authorities. The whole bridge, including the baby, was painted white. Technically, the contractor had only done his job, it was indeed illegally put up, but people were furious! It was called a scandal, and made the evening news on national TV. Just a few weeks later AFK hit the same venue again. This time with “In Case Of Emergency, Break The System”, his most obvious political statement to date. The message to the public was to be more critical of the mass media, concentration of corporate power and modern technology. To make sure the piece received the proper attention, he teamed up with fellow street artists and brought the local newspaper behemoth, BT with him to document the illegal hit and run job. Oh, the irony! In early January of 2017, AFK made headlines, again. And again the message was extremely explicit and political, even bordering on propaganda. “Enjoy the real thing” popped up over night on a University wall across from St. Paul’s Catholic School. At first glance it comes across as the logos of Coca Cola and Pepsi. On closer inspection though, you would have found that the company names had been replaced by the names of Al-Qaida and Isis. Was he making a comparison between American brands and terrorism? Unfortunately, the piece was almost immediately painted over. According to the local newspapers, the school Headmaster said it had spread fear and anxiety among the students. This, of course, prompted AFK to react. 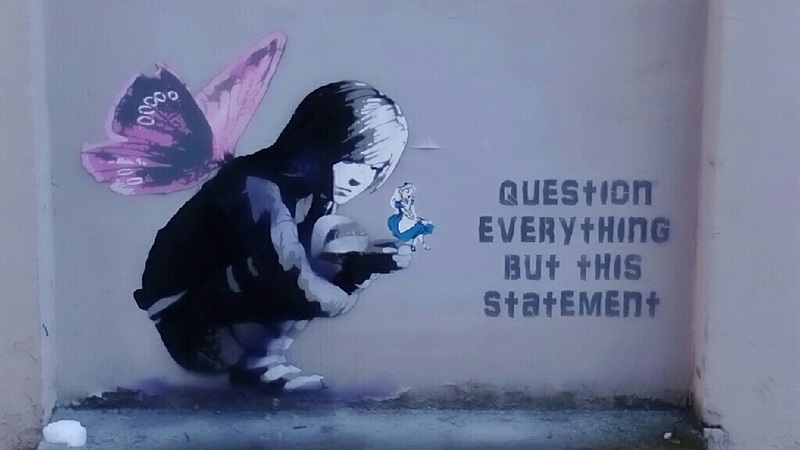 Not only did he do the original piece again, this time facing the university, the spot of the original misdeed instantly got a new piece as well: “Question everything but this statement”. The piece shows a little girl with butterfly wings inspecting a butterfly, A few days later, the butterfly on her hand is gone and replaced by Alice in Wonderland. If you visit the spot now, Alice is also gone, and the girl is now studying a miniature version of herself. Next to the piece you can read the title in big letters. His latest work is called “Empire of Sweet Dreams”, and it’s possibly his most impressive work to date. You can behold this work on a 70 meter long wall across the street from the new Bergen Airport terminal at the Choice Comfort Hotel. When viewed from a distance, the overall narrative can be sensed. But the closer you get, the more you will discover. The artwork stands out as rich in detail, with a lot of references to both cultural and historical landmarks. One of the highlighted details is, Göbleki Tepe, an ancient site discovered in the 1990s, AFK explains, which has been successfully carbon dated to at least 11,500 years old! Another detail that can be found in this massive piece is the text “Our future lies in the truth of our past”. Even though this piece is a commission on behalf of the hotel, the critical and free thinking spirit of AFK shines through. The artistic claw of a true intellectual can not be hidden. To capture the essence of AFK’s spirit in just a few short examples is difficult, but for me, “Laugh” stands out. It’s an apt comment on the terrorist attack against the French satirical magazine Charlie Hebdo. It depicts a Muslim and a Jew sitting close together, laughing and enjoying themselves with a copy of the magazine. AFK personally went to Paris and handed a canvas of the piece to journalist Zineb El Rhazoui, who survived the terrorist attack. AFK is nothing if not emphatic. What actually is his outlook on life and the situation we face as human beings? – Because of the serious undertones in a lot of my work, some people get the impression that I am pessimistic about our future on earth, he tells me. – I am actually optimistic. But to understand how to traverse the road to peace, people have to be subjected to some uncomfortable truths. But as the saying goes, “You can bring a horse to water, but you can’t make her drink”. AFK remains anonymous, mostly to avoid legal problems, street art is after all regarded as illegal by the authorities. Whenever he is interviewed by the press, it’s always under the condition that his anonymity is safeguarded. When he asked me to write this short bio, he contacted me by an end-to-end encryption e-mail service. This guy takes no risk with his civil liberties. WikiLeaks recently published a leak on the U.S. Central Intelligence Agency. These documents, as did the Snowden leak, show that AFK has a point. A couple of years ago AFK even made a tribute piece called “The Un-Usual Suspects”, based on the iconic movie poster, where he portrayed five western dissidents. Julian Assange was one of them. In his encrypted e-mail he says: – To stay quiet would be to let down our fellow human beings. This short statement may be the essence of his artwork. Forrige Sosialistisk eller Opportunistisk Venstreparti?